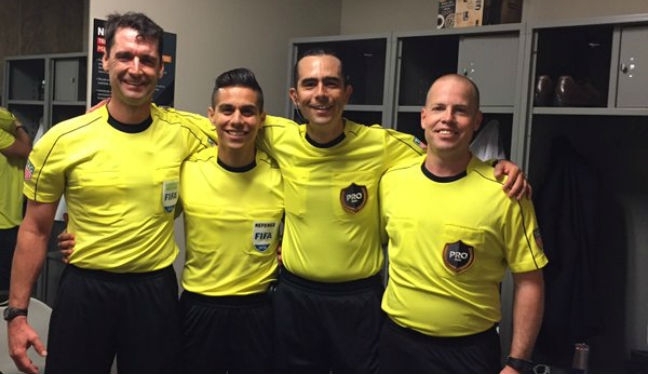 Jaime Herrera was delighted to make his Major League Soccer refereeing debut in Week 11 of the 2016 season, in what is his first year on the PRO roster. The Mexican official is listed as a fourth official but took the whistle for San Jose Earthquakes versus Houston Dynamo. After impressing, he was straight back in action the following week, handling another midweek match-up, this time between Philadelphia Union and D.C. United. Congratulations on your debut in the MLS middle, and the progress you’ve made. What was your initial reaction when you found out you were assigned to the game between San Jose and Houston? I didn’t expect it, I was very surprised, but I knew that I had to be ready for when the day arrived. I have worked and waited a long time to reach this goal. I felt grateful with life, God, my family and friends for their support and unconditional love – and the most important thing is that I realized that all my effort had paid off. Did you enjoy your debut, and how did the game go? The game is definitely the one that I enjoyed most in my whole career and life. It was a very, very special debut, at a personal, professional and family level. It was a great match, both teams came out to win and that will always be good for football. It was an exciting game, technically and tactically very well played by both teams and that made it very interesting. Your crew consisted of Frank Anderson, Michael Kampmeinert and Armando Villarreal in that first game – how were they to work with? I had the fortune to work with some true professionals with real quality and that is valuable to me. I felt as if I had worked with them for a long time. Working with such experienced and professional people always will be a privilege. Their commitment to help me, support me and teach me was unique. My permanent thanks to Frank, Michael and Armando for making that special day for me. Do you feel like you are developing as a referee? I think that I’m on the right way. I am very thankful to be able to do what I like and enjoy doing. Having been assigned to referee two matches in 10 days makes me, and keeps me, very happy and motivated. Life has taught me that if you put in the work, quality and time then it will be given back to those who deserve it, and I’m fully focussed on that. What are your future targets as an official? To be considered a reliable referee, able to officiate any game regardless of the degree of difficulty. I want to enjoy every game and help PRO and U.S. Soccer be recognized for having the best referees in the world.